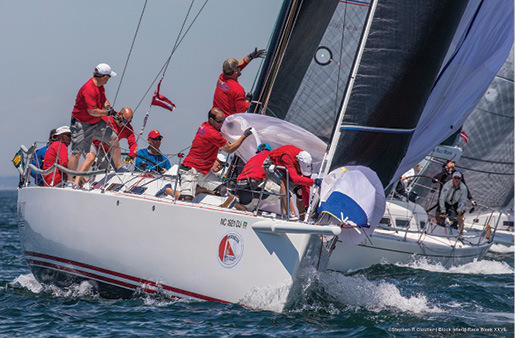 The 28th edition of the Storm Trysail Club Block Island Race Week will be held Sunday, June 23 through Friday, 28, 2019. The plan is for four days of racing, bringing back the popular lay day (if weather permits). The highlight of this event is the Around Block Island Race in which the entire fleet circumnavigates the island. Over 150 boats are anticipated for an expanded number of racing formats that seek to accommodate an even wider array of yachts – from world-class Grand Prix teams to families and friends racing their cruising boats. “We will have the usual windward/leeward racing for the majority of the classes, but we will also include pursuit and ‘Solent-style’ racing formats,” said STC Rear Commodore and Event Chair Ed Cesare. Multihull and Non-Spinnaker racing, and the ORC handicap system – which is catching on around the country – are also returning. As always, there will be tent parties, shoreside activities, and all the fine dining, watering holes, beaches, and sights that Block Island has to offer. For more details, log onto blockislandraceweek.com.